Totally stunning remodeled 3 bedroom 2 bath 2 car gar single level home that looks brand new inside and out! Amazing upgrades must see! 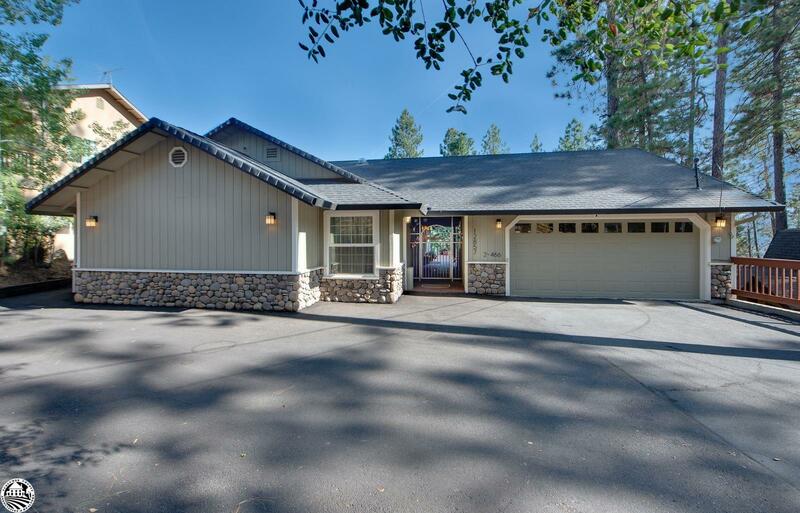 This elegant remodeled cabin home just could not be any better! In the perfect setting nestled in the trees, enjoy beautiful outdoor living with picturesque views rain or shine as not only is there an outdoor patio deck but a covered patio deck as well. As you park on the LEVEL driveway with overflow/RV parking plus 2 car garage with covered breezeway access to the front door, you enter a beautifully custom iron gate that not only is amazing but also allows for personal security to your front door and back decks. This charming home has knotty pine vaulted ceilings, river rock hearth with a cozy wood burning stove fireplace. Beautiful night sky high windows. Dramatic one of a kind solid natural quartz/granite stone slab counter tops, and over-sized breakfast bar, natural stone backsplash, solid cherry wood soft-close cabinetry with pull-outs, all newer stainless and black stainless appliances including wine refrigerator, recessed & drop pendant lighting. Upgraded master bedroom closet 10x16 size with skylight, remodeled master bath with porcelain tile & oversized shower with 1/2" glass door, quartz double vanity with marble backsplash, recessed mirror storage cabinets, Alder wood cabinetry, vanity side lighting. Upgraded circulating hot water system, instant hot water at kitchen sink, all electrical updated, 2 year old paint with 40yr paint grade. Redwood decking with custom metal railings, 5 1/2" baseboards, cove overhead lighting in bedrooms all with ceiling fan/lights and dimmer switches, paneled double pane windows throughout. Carpeted bedrooms and living area Tiled Luxury Vinyl, carefree and resilient in subtle light stone neutral colors. Indoor laundry w/skylight, practical use custom cabinets & storage/hanging bars. Nest control HVAC. Over-sized 2 car garage w/built in cabinets, free standing cabinets, work bench, overhead attic storage. This is a turnkey home in move in condition and furnishings available for purchase.